When you translate 'FIGO' from Italian, you get 'cool'. Which fits this place perfectly. 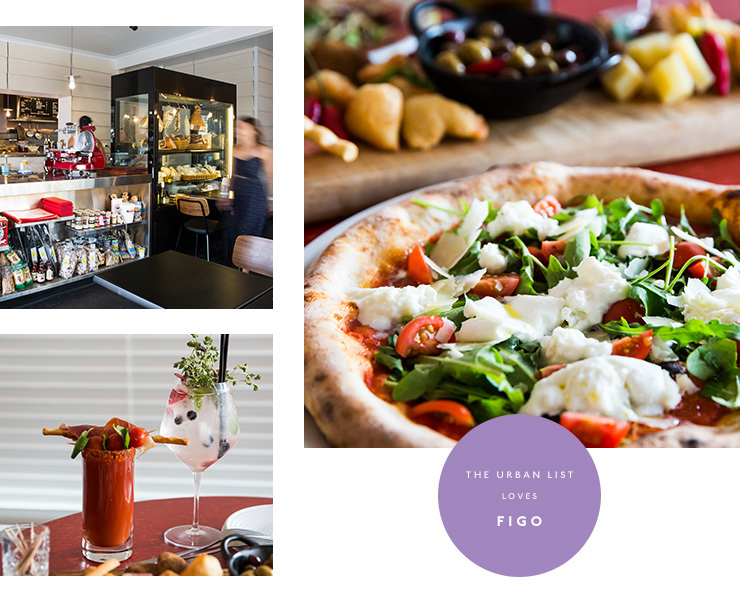 FIGO is a friendly neighbourhood pizza bar in Elwood. The décor is New York diner-style—round red tabletops and an exposed steel kitchen where you can see your pizza made before your eyes. The restaurant is almost easy to miss from the street. It's off the small strip of Brighton Road that's sandwiched between the Nepean Highway. But listen, next time you’re driving past, get in the left lane and take yourself down a side street to park—it’s 1000% worth it. Head Chef and owner, Valerio Calabro, also the man behind Hampton hot spot La Svolta, brings a menu that explores every delicious inch of Italian cuisine. The seafood, like the deep-fried calamari, prawns and whitebait (served with housemade mayo) are all about Italy’s coastal regions. The polenta chips with cheesy seasoning give you a taste of northern Italy, and the arancini balls (available in Bolognese or mushroom, natch) are all Sicily goodness. Some dishes can be adapted both ways, like the panelle: garlicky focaccia, marinated eggplant and chickpea fritters. Our friendly waiter told us there's two ways to eat these—load the bread with all the toppings like they would in Tuscany, or ignore bread altogether and have the fritter and eggplant with a squeeze of lime, like they do in Sicily (you can eat the bread after to *cleanse* your palate before your next dish). Well, we tried both (just to be thorough) and can confirm that they were equally delicious. FIGO's pizzas—and they do delivery for these babies as well—are woodfired to perfection, with a crunchy Roman-style base. On Monday's you can pick up a cheesy margherita for a measly $12. On Sundays, FIGO are testing our waistbands and stomach endurance with all you can eat Italian ‘yum cha’ for $35pp (cheaper for the littlies!). It's called Magni-FIGO. Geddit? You start off with bread, then a selection of fried Italian street food, before finishing off with pizza and pasta. When we say pace yourself, we mean it. When we went for lunch, and by the time the cheesy, homemade gnocchi came out, all we could do was stare at it mournfully, inhaling the goodness and wishing our stomachs could stretch for one more bite. (I mean, we ate it in the end, but there was a small moment of panic). Our must-try recommendation is the Sicilian eggplant parmigiana: a sickeningly good pile of oozy cheese and salty eggplant. If you take a particular fancy to any of the ingredients used in your meal, you can pick them up from FIGO's cabinet of meat and cheese. They've also got several shelves, well-stocked with imported Italian goodness (you can get most of this from FIGO Cantina, nextdoor). Of course, you can’t eat all this food without having something to wash it down. FIGO offers up a selection of Italian and Aussie wine, plus a cocktail list with a twist on your old favourites. The Bloody Maria is a concoction of garlic-infused voddy, Grappa (a grape-based liquor), passata (tomato puree), Sangiovese (Italian red wine) and a dash of balsamic. Dee-lish. One final piece of advice: as tempting as it is to eat yourself silly, make sure you save room for some gelato. Trust us. Want to learn more about FIGO? Check out our Directory page.